You could say that Jeremy Avery started “working” in electrical-related warehouses when he was ten years old. His father is a veteran of electrical distribution, Jeremy explained, and as a child has fond memories of going to a warehouse on the occasional Saturday. “From when I was very young, he’d have me with him, visiting a warehouse on Saturday. So I was exposed to it at a young age,” he said. Fast forward to 2005 and Jeremy’s father was then working for NorthEast Electrical Distributors. “I was working for a different company and a position opened here in Hartford. He asked me if I was interested in it and I gave it a shot” Jeremy explained. 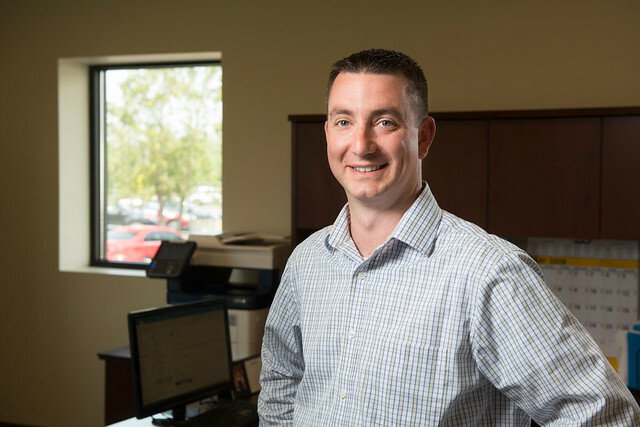 Thus began a steady rise through NorthEast, starting in the warehouse and then moving on to counter sales, inside sales and outside sales before being promoted to his current title, branch manager at the Hartford, Conn., branch. Jeremy looks back and explained that he learned the most, especially about customer relationships and the products being sold, from his time spent in inside and, later, outside sales. Jeremy’s Hartford warehouse has a variety of customers but for the most part, he explained, they sell to and work with commercial contractors. A key part of NorthEast Electrical’s success is building and sustaining those strong relationships with manufacturers and vendors, he said. Sales at the NorthEast Electrical’s Hartford warehouse have grown over the past three years from about $17 million annually to a projected $26 million for 2019, Jeremy said, while praising the eight- to 10-person staff he oversees. Jeremy and his wife, Nicole, have two children: Olivia (9) and Gavin (5). The children’s’ hobbies are the parents’ hobbies these days, with Olivia participating in basketball and softball while Gavin plays soccer and t-ball. A. If you work hard, especially if you’re a younger age, the opportunities within the industry for a career are almost endless and you’ll have many choices of positions and directions to take that in. Just the wording—“electrical”—and what comes to mind is the electricity that flows through the power lines to your house. But it’s really not that. It’s electrical product that is distributed to customers. So it’s a B2B business. We are not physically in the field with contractors, perhaps, but we’re still touching the same product. Most of the time you’re not going to physically put it together yourself, but you’re going to have to know how it goes together or comes apart. Q. You and many in the electrical industry seem genuinely enthusiastic about your work and about the industry overall? Why do you think that is? A. For me personally, as you build the relationships with the customers, some of them become friends of yours. Their business becomes as important to you as it is to them. So you can really help them in many different ways. When you’re servicing them it almost can become personal to you to do a good job. If they’re there doing a job tomorrow at somebody’s business—and you send the wrong product or provide low-quality service or whatever it may be—they could lose a customer over that. So for that one customer, something like that could be the difference between success or failure.